Click here for map in pdf format for printing. This walk is entirely within Wheaton Regional Park and covers most of the outside perimeter of the park with the exception of the Brookside Gardens. It starts from the south side of the parking area accessed from Shorefield Road. The walk starts from the parking lot adjacent to the carousel. Walk to the end of the parking lot and take the asphalt trail to the right of the train station. The trail crosses a service road and enters the woods. After entering the woods the trail crosses a wooden bridge and ends at an intersecting trail. Turn right on the intersecting asphalt trail and walk up a slight hill. A gravel trail intersects from the right. Continue straight on the present asphalt trail. The trail intersects with an asphalt trail. Continue straight on the present asphalt trail. After walking a short distance the trail will pass near a series of athletic fields on the right. The trail crosses an access road to the dog park and inline skating area on the left. Continue straight on the asphalt trail on the other side of the access road. The asphalt trail turns right at the intersection with a natural surface trail. Turn left to follow the natural surface trail. Notice the trail marker indicates this is the direction to the Nature Center. The trail passes an informal trail on the left. There are no trail markers at this intersection. A natural surface trail intersects from the left. Continue straight on the present trail. The trail marker will indicate you are headed towards the Nature Center. A natural surface trail intersects from the right. Turn right to follow this trail. The marker will indicate this is the route to the horse trail. After a short distance the trail ends at the horse trail. Turn right to follow the horse trail down the hill and curving to the left. An informal natural surface trail intersects from the left. Continue straight on the horse trail. A service trail intersects from the right from the maintenance center. Continue straight on the horse trail. The trail passes through a clearing that used to be a road to a campground. There no longer is a campground in this park but traces of it can still be seen. Looking to the right you can see the road to the maintenance center in the distance. Continue straight on the horse trail. It will go down the hill and follow Kemp Mill Road for a considerable distance. A natural surface trail intersects from the right coming from Northwest Branch Park. Continue straight on the horse trail as it turns to the left to follow Glenallan Avenue. A natural surface trail connecting to a bridge intersects from the right leading to the stables across Glenallan Avenue. Continue straight on the present horse trail. A natural surface trail intersects from the right. The horse trail turns left and goes up a hill. Turn right to follow the narrower natural surface trail. The trail marker will indicate this is the route to the Nature Center. The trail follows a stream and Glenallan Avenue on the right. The trail intersects with a natural surface loop trail. Take the trail to the left to avoid a stream crossing. The trail passes by an amphitheater just prior to intersecting with the Nature Center service road. Continue straight on the asphalt trail on the other side of the service road between the fences with a pond on the right. Turn left at the Nature Center parking lot and walk to the end of the lot. Take the natural surface trail on the left side at the end of the parking lot. The trail marker should indicate this is the direction to Pine Lake. A natural surface trail intersects from the left. Continue straight on the present trail in the direction of Pine Lake. At the next trail intersection turn to the right in the direction of Pine Lake. The trail follows a fence for Brookside Gardens on the right. The trail intersects with a gravel service road. Turn right to follow the road across the dam at Pine Lake. People enjoy fishing from this location. Turn left onto another gravel service road after crossing the dam. This road follows the side of the lake. After passing the lake the service road crosses a bridge over a stream feeding the lake. The service road turns right and crosses a miniature railroad track. After a short distance the service road crosses another section of miniature railroad track. After passing a house on the right the service road intersects with an asphalt path crossing. Turn right to follow the asphalt path back to the parking lot marking the start of this walk. 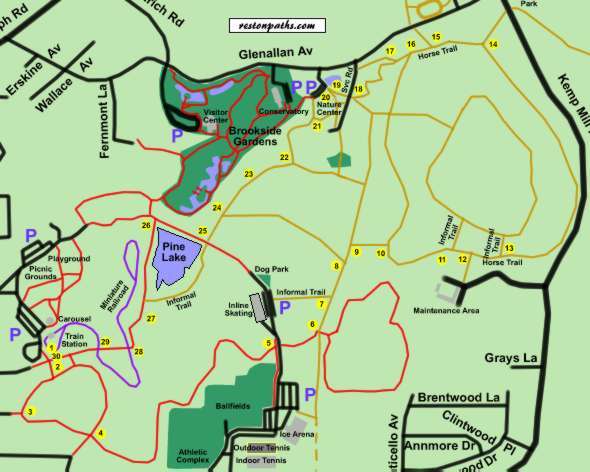 See the general Wheaton Regional Park section of this web site for driving directions to the start of this walk.